This week, Faith and the gang discuss the best (new!) non-stick pans to buy—and one of the top picks is just $44. Plus, Mark Raymond introduces a $14 organic red wine, Cuma Malbec. It drinks like a $30 bottle, and Faith’s serving it well chilled. And Alex Province shares his mother’s recipe for Chorizo with Clams and Rice. Invite some friends over for this. Finally, the Kreitlers are in the house! 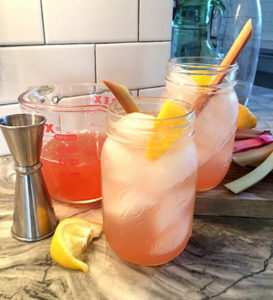 Allison, a freelance recipe developer and food stylist, and her finance-wiz husband Charlie join the party to share a simple summer spritz and a fresh hors d’oeuvre you can change up for every season. Right now, we’re using peaches and nectarines as the base for goat cheese, pine nuts, and local honey. And since Faith asks Charlie to sing for his supper, you’ll get a few quick tips from one of New Haven’s top wealth management professionals. As Charlie says, “when Allison’s around, supper is worth singing for.” Awww. There’s more where that came from, and plenty of summer party food ideas to go around.